In the fine tradition of the Griswald's, my mom and dad had make the trek across the pond to visit us. My mom has only been on a couple airplanes in her life and the 7-hour trip over was quite daunting. If you see her, give her a pat on the back for the effort. As you'll see, we crammed quite a bit into their week-long trip. Feb. 8, 2008: I finally got around to scanning a bunch of negatives and added a few more photos from Henley, Normandy, and the southwest of England. My dad and I are in front of our flat in the left photo. The right photo shows my mom and I standing on the footbridge that crosses a portion of the famous Bristol Floating Harbor. The city center is behind us. I think one of the coolest things in Bristol is the SS Great Britain. It was designed by Bristol's most famous son, Isambard Kingdom Brunel, the greatest engineer of the Victorian Age. 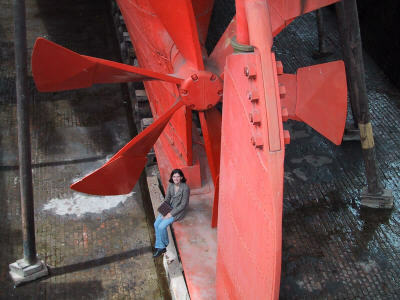 The ship is in dry dock and now a museum. You can get a sense of the shear sized of the ship when you compare the pictures with my dad and Erynn. Another Bristol landmark created by Brunel is the Clifton Suspension Bridge. The bridge is visually stunning and is typically featured in about 87.2% of all postcards of Bristol. The bridge was started in 1831 and finally finished in 1864. For student of American history, that was all before the end of the Civil War. Just across the park on Brandon Hill was our favorite pub, the Hope and Anchor, affectionately know as the "Dope & Wanker". 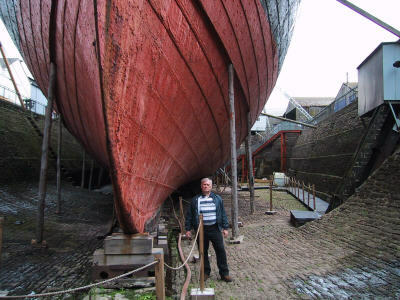 Next to the SS Great Britain is the Matthew, which is a replica of the ship that Bristol's John Cabot sailed to the New World over 500 years ago. The claim is that he was the "original" discoverer of the New World ahead of Columbus... but somehow after the Vikings and after the Indians. But who's counting? Here's my mom at the City of Bristol Rowing Club standing next to my boat the Come Along Side. And no day walking around the Docks is complete without a bite to eat at Gloria's. Home to the best sausage or bacon butty you've ever had. 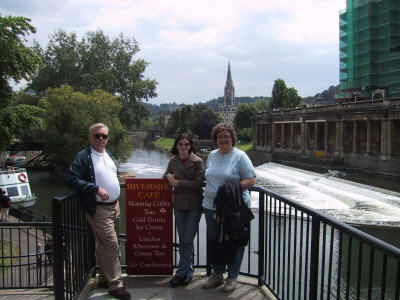 The City of Bath is near our home in Bristol. It's quite the little tourist trap because it's pretty and compact. It was a gorgeous day and you can see a bit of the city in the background. The city was originally settled by the Romans, and they built an amazing structure around some hot springs to "harness" the healing waters. During the Victorian times the Roman ruins were re-discovered and a town built up around the tourist trade. And for a small fee you too can bathe like the Romans. Here are a couple photos of my dad inside the Roman Baths. 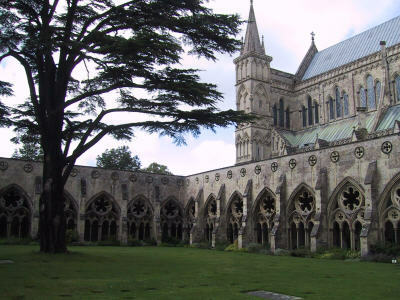 Another stop on the "tourist triangle" of southwest England is Salisbury. Couple a quaint medievil town with an impressive church (Salisbury Cathedral) and you get a Destination. The church's steeple is rather impressive by how steep it is. Quite dramatic. And one of the original copies of the Magna Carta are on display there too. We spent the day walking around and had a great meal in the city centre. Until the British finally realized that they could leave their island and actually holiday in places with good weather, the British seaside holiday reigned. Unfortunately, the seaside holiday in Britain is slowly declining mostly due to cheap flights to cool places like southern Spain and France. 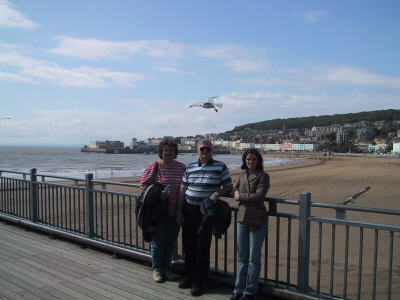 Weston-super-Mare is a little seaside resort down the M5 from Bristol and we took my parents there for a day. A British seaside resort couldn't be complete without a peir with an arcade at the end. As you can see, we were about the only people there, but it didn't take away from the beauty. I guess, other than the weather, Weston could be a really neat place to be. More photos from the Weston-super-Mare pier. Erynn and I are suckers for shoot 'em games. 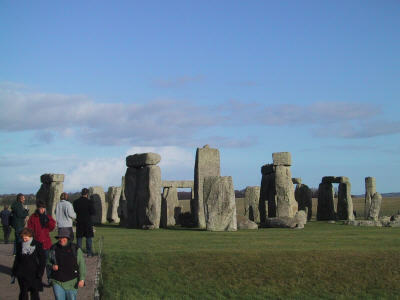 To complete my parent's tour of southwest England, here is a picture of some big rocks in the middle of a field. we also made a quick trip into London to see the major sites. Above are the obligatory photos in front of Big Ben and the Houses of Parliament. The London Eye is across the Thames from Parliament. I've actually never ridden on it because the wait is always ridiculous. Also, we swung by Westminster Abbey, but I didn't take any decent photos. The actual highlight (though you can't tell from my expression) was getting my folks to ride on the Tube. One of the highlights of my life was racing in the Henley Royal Regatta. I had spent over a year training 10-12 times a week to get fit enough to compete in the race. 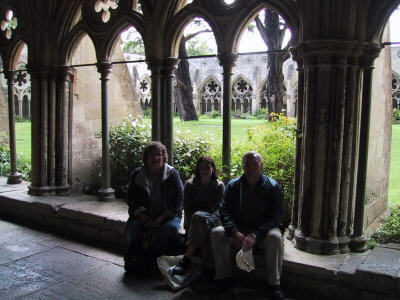 My parent's coordinated their trip to England in the hopes that I would qualify. Our rowing club had never gotten a boat out of the Qualifying Races and in 2002 we got both a Wyfold 4 and Thames 8 into the main event. Each crew gets one ticket for someone to ride in the launch and follow the race. My team voted and gave my dad the ticket for the Wyfold race. They gave the ticket for the Thames race to Brian Stephenson who is the stalwart of Bristol City. Having my dad be able to watch my in my biggest race was an amazing experience. Both my parents had watched me race numerous times and they were taken back by the pageantry and size of the regatta. While I was preparing for the races, everyone else got to tailgate British style. Pimm's, cucumber sandwiches and strawberries anyone? 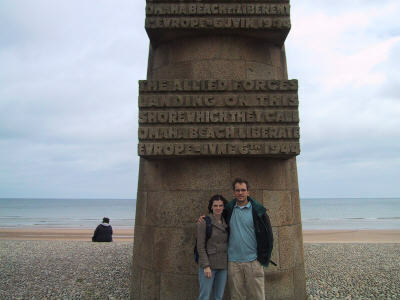 We all drove over to northern France via ferry to visit the D-Day battlefields. 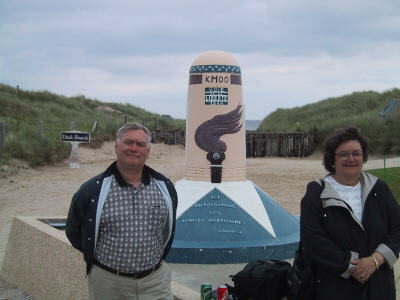 Here are my parents in front of one of the Allied markers at Utah Beach marking kilometer zero of the advance. Here we are in front of the Omaha Beach Memorial. The most incredible part of the trip to Normandy was walking around the Normandy American Cemetary and Memorial. We've all seen the D-Day movies, but nothing makes it as real as seeing the beaches and the acres upon acres of white crosses. Here are my mom and dad in front of the Memorial from the Gardens of the Missing. Some more photos from the the Memorial from the Gardens of the Missing. Go to this place. Look at the crosses. Then you'll get a sense of the sacrifice. When I saw the cross on the left I started to cry. This young boy gave his life and his parent's never knew where he was buried. Someone else had to the put this flag on his grave. 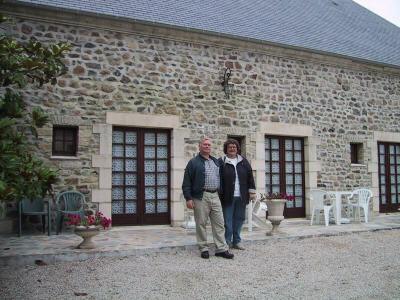 We stayed the night at the Chateau du Quineville. This is the picture in front of our room. My mom was incredibly thankful Erynn speaks a bit of French and could order dinner for us all that evening at the chateau. Erynn couldn't convince my mom to try one of her snails. 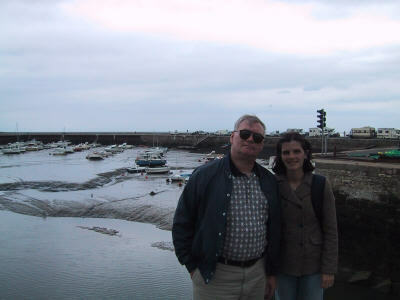 While driving to the visit the Allied grave yards, we stopped in this immensely cute French fishing village for lunch. Port-en-Bessin. We took this picture by the harbor and I was amazed by the size of the tidal range as you can see from the boats resting on their bottoms. 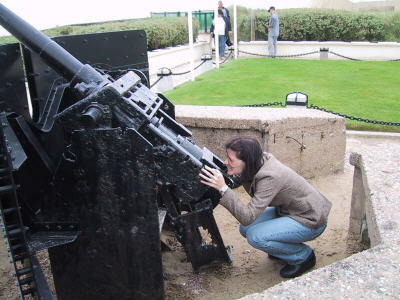 While visiting Utah Beach, Erynn thought she'd take aim at a couple passing airplanes.